I wasn't even asking. That's what struck me as odd. "Thank you for this book, for the truths it contains, for the way it's changed my life." I paused. "It's true, isn't it?" But it wasn't quite phrased as a question; it was more of a statement. "It's true, isn't it." For the first time in my life, I felt a warmth begin to grow in my chest, starting right in the center and spreading until it filled my whole chest with heat and light. I didn't hear heavenly choirs or see angels. I didn't feel chills or cry. I simply felt a burning, and that's the best word for it, that stayed for several minutes before gradually subsiding. It was a comfortable, yet powerful burning, pulsating and joyful. It was very physical and very real. It took me completely by surprise and overwhelmed me. And as it started, I asked God, "Wait, is this the 'burning in the bosom' spoken of in D&C 9?" But by the time I formed the question, I knew the answer. And much more. Like most Mormons, I had been taught plenty of lessons telling me about this "burning in the bosom" promised to Oliver Cowdery. I'd been told this was how God answered prayers, and that I should seek answers in the same way. A burning means yes. A stupor of thought means no. It's the burning/stupor dichotomy, or in short, B/S. Oh, I had tried it before, all right. I had prayed and asked lots of questions, waiting and seeking that burning. It had never come. And you know, having never been "stupored" before, I wasn't quite sure how to recognize that one either. Through seminary, Sunday school, a year of college and half a mission, mostly nothing happened at all when I prayed, and the conversation in my head went on until I gave up and decided the Lord had no answer for me. I didn't realize the conversation in my head was the answer. That's why I was so surprised that night in 1990 in South Carolina. I had been studying scripture before bed; my companion was already asleep in the next room, and I was just saying my nightly prayer. I didn't realize there was anything unusual going on at all. I wasn't seeking any sign. And yet, I powerfully, unmistakably, burned. This was NOT how I had been taught things should work. Since that time, I've spoken with, or read the thoughts of, many Mormons who are very frustrated by the B/S dichotomy because they've tried it without results. Common expressions are "I don't know if I have a testimony, because I prayed and didn't feel anything" or "I've asked and asked for years if the Book of Mormon is true, and never received an answer." And yet, many of these people continue to attend church, serve faithfully, even teach the B/S dichotomy lesson to others, all the while feeling "unworthy," unloved by God, and substandard in their faith. 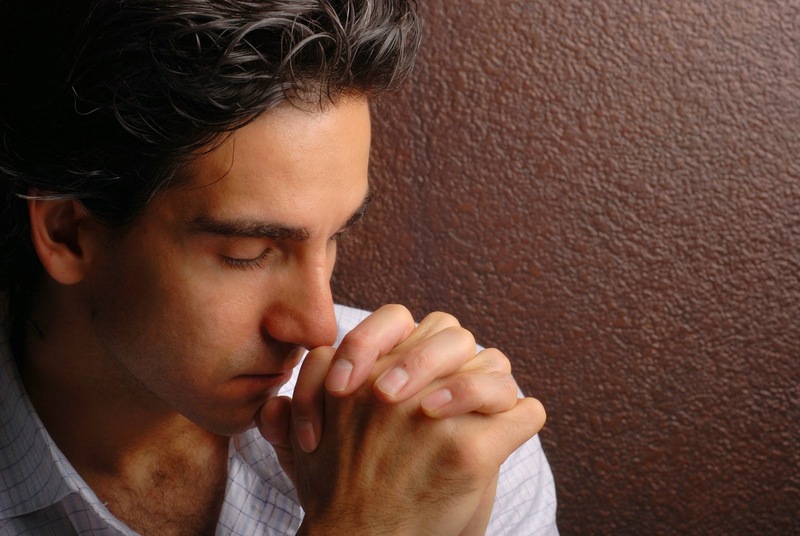 In a religion that places so much emphasis on seeking answers in prayer, and "worthiness" to receive them, many of our brothers and sisters suffer spiritual agony because they've been taught unbelief by the traditions of their fathers—traditions that tell them other Mormons get answers, but they don't. Maybe they're just not good enough. Maybe God isn't. It's no small thing to feel rejected by God. The pain is real and persistent and awful, and in this case, completely man-made. Let's bring this abuse to an end. The desire to communicate with the divine is fundamental in each of us. Our spirits are imprisoned here in telestial flesh, cut off from their native, glorious habitat, lonely and empty. Our yearning for God is a gift designed to bring us home. In my last post, we discussed some of the ways the Holy Spirit communicates with us to teach us knowledge, and eventually bring us back home, into God's presence. The process relies on our learning to recognize, accept, and act on personal revelation. But this process also requires faith. It's no small thing to take action based on the thinnest of evidence—perhaps nothing more than a voice resonating inside you—when there are so many other voices in this world telling you to do otherwise. Faith is hard work, and we want something easier. And he that believeth shall be blest with signs following, even as it is written. (D&C 68:10) See also: Mark 16:17, Mark 16:20, Mormon 9:24, Ether 4:18, D&C 58:64, D&C 84:65 and others. This is promised A LOT. Here's the point to understand: Signs do not produce faith. Signs follow faith. Signs which follow faith do not come as a result of what men seek, but come as a result of what God wills. It really comes down to the order. If you insist on a sign to convince you something is true, you will not receive it. On the other hand, if you willingly believe based on the thinnest of evidence given by the Holy Ghost, and you act on this belief to develop faith, signs will surely follow. It kind of reminds me of that old saying about trying to get a loan from a bank: "The only way to get the bank to loan you money is to prove you don't need it." Well, the surest way to receive a sign from God is to show, by your faithful actions, that you don't require a sign. And so, with this foundation in place, we come to Oliver Cowdery and the burning bosom. 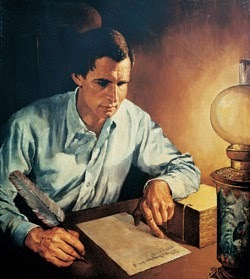 As you know, Oliver was scribe for Joseph Smith in the translation of the Book of Mormon. As he worked with Joseph, Oliver also developed the desire to not merely write for Joseph, but also to translate like Joseph. So Joseph asked God, and received a revelation now recorded as D&C 8. The Lord, having explained previously that translation work must be done by faith, now explains that Oliver failed to approach it that way. See, faith requires belief and action together. It's not enough to merely believe. You have to actually do the work that believing requires you to do. In this case, the Lord says Oliver "took no thought" about the translation, other than to ask God to give it to him. As the Lord explains, Oliver was required to do more than just ask. He was required to "study it out in [his] mind" before asking. What does that mean? How do you study it out in your mind? So, in accordance with this, my determination to ask of God, I retired to the woods to make the attempt. Joseph studied it out in his mind. He labored, pondered, considered, reflected, studied, and at length came to a conclusion for himself. He decided to act on the only answer that made any sense to him. The words of James entered into his heart, Joseph believed them, and made a determination to act. Only after that lengthy process of preparation, did Joseph put the question to God. Having done all he could to settle the question for himself, he took his conclusion to God. Nephi desired, believed, and spent time in the mental exertion of pondering to reach the best conclusion he could on his own. Only then did God take over to settle the question and turn Nephi's faith into knowledge. So, getting back to Oliver, as the Lord points out, Oliver skipped all the mental exertion and labor required. He didn't want to work by faith. He wanted to just be handed the knowledge without paying the price to obtain it. He "took no thought" other than to ask. But let's suppose Oliver had heeded the Lord's warning that "without faith you can do nothing." Suppose he had worked by faith. What might that have looked like? Perhaps Oliver would have spent quite a bit of time laboring with the plates, staring at the characters, working with the "translators," praying and seeking revelation. Perhaps he might have noticed patterns in the engravings, similarities in the characters. At length, suppose a certain character had stood out to his attention, and a still, small, barely noticed voice had whispered inside Oliver. Maybe the whispering was only one word. But suppose Oliver had noticed it. Written the word. Pondered upon it further. Looked for other instances of that character. Told the Lord what he thought it meant and asked for more guidance. Suppose that several hours, or even days into the process, Oliver was hearing the voice more often, paying attention to it, writing what he could, or what he thought, crossing out and starting over, and editing it as he asked for direction. And finally, suppose that after much effort, by fits and starts, Oliver had finished a paragraph. And he thought it was right. And then, having paid the price in faithful labor, having "studied it out in his mind," (where the Holy Ghost speaks,) suppose Oliver had presented his tiny translation to the Lord and asked "if it be right?" What did the Lord promise? "if it is right I will cause that your bosom shall burn within you; therefore, you shall feel that it is right." A witness after the trial of his faith. Once Oliver had paid the price and brought the Lord something to verify, the promised signs could have, and would have, become operative. Notice that the Lord didn't say Oliver would feel good about it, be happy, get chills, or cry great tears of joy. Perhaps those would have been Oliver's emotional responses to having the Lord verify the translation, but the Lord offered a specific, physical sign that would turn Oliver's faith into knowledge. You must seek revelation. The Lord will first "tell you in your heart and in your mind." You must study it out. You have to act on what the Lord has revealed to you, no matter how slight, before He can reveal more. You must work with the Holy Ghost until you have reached a conclusion. It may be a tentative conclusion, but you must be committed to it, and absolutely willing to act upon it. If you're not already convinced, the Lord will NOT convince you. Only when these first steps are in place can you expect the Lord to confirm the conclusion you have reached, and that only AFTER your faith has been tried. Are you starting to see how this faith stuff works? The reason it's evil to just ask for a sign is because it robs you of the experience of struggling in the dark toward the faintest glimmer of light, learning to walk by faith for yourself, instead of by sight. God's work and glory is to bring to pass your immortality and eternal life (Moses 1:39). He won't let you shortcut that process, stunt your own growth, and damn yourself with cheaply won knowledge absent faith. It's evil to try. So how do we apply Oliver's lesson in our own lives? First I'll tell you how we DON'T apply it. We don't tell ourselves and our children, and our classes at church, and our home teaching families that all we have to do is ask God a question and he will cause a burning or a stupor. Remember, this is the B/S dichotomy. By teaching such an idea, we are teaching sign seeking and damning anyone who believes us! This is wickedness. No, we should learn ourselves, and teach our families, to seek revelation through the Holy Ghost by the still, small voice. You know, just like it says in the scriptures. We must understand the struggle, the mental exertion, the time, attention and pondering required to "at length" reach a conclusion for ourselves, the best we can. Then we must act on that conclusion. Finally, having paid the price, and fully, completely intending to act on what we have learned by revelation, we can go to the Lord for a confirmation of what we have received. Done this way, it's not sign seeking, because we already believe and are acting in faith. And I have it on good authority that "signs follow those that believe." But, what if there is no confirmation? No burning, no stupor, no lightning bolt, or dove, or dew, or voice to shake the earth? Continue on the path you're on. Your faith has not yet been fully tried. Trust the answers the Holy Ghost gives, for that is how they almost always come. And so, this brings us back to a rather ignorant, young missionary on his knees at night in a dingy apartment in Rock Hill, South Carolina. He has studied the Book of Mormon for years. He has tried to live its teachings. He believes it is true, though he has never received any sign, despite having asked for one in the past. He is satisfied that it is true because the Holy Ghost has given him light and knowledge through it. Therefore, he works to teach and testify of the truths in the book. Not true? Why would you ask if these things are NOT true? Hmmm. Maybe...because you already believe these things ARE true? And you're not asking the Lord to convince you of anything you don't believe, but only to confirm something you already believe in faith? How would you ask such a question? "I'm determined to live the teachings of this book because I believe this book is true. Is it not?" Or as the missionary inadvertently worded it, by the power of the Holy Ghost, "Thank you for this book, for the truths it contains, for the way it's changed my life. It's true, isn't it?" And the light came on. And the sign was given. And the young missionary no longer had faith that the Book of Mormon was true. Because now he knew. Signs follow belief to confirm what is already believed. Is it any wonder, then, that the ordinance in which we are invited to "receive the Holy Ghost" is called, "Confirmation?" Can I borrow this and the previous post for my talk on the Holy Ghost at my son's baptism tomorrow please? Powerful Adrian! Thank you for sharing your testimony, let your light shine! I don't think the First Vision account supports the idea that after a trial of your faith that a sign is given. In fact, it was after the sign was given that the trials for JS began. So, I would offer a different view here. Signs aren't something we earn through long suffering and trials (of our faith or anything else). Signs are simply evidence of God and happen as a consequence of God's interference with us or others. Whether or not God chooses to interfere with us, whether to speak with us, appear to us, heal us or someone else is entirely up to God. Man simply can not command God or petition or suffer or do anything to make God do anything. God will do as he wills. Now, I would agree that one should not seek signs. However, we should prepare ourselves if God does choose to interfere. I guess I view it this way (having seen a god-like being myself and experienced their nature for myself): There is a rational reason to believe God (or god-like beings) exist in our universe. We know enough now about the size and age of our universe to realize we are not the only intelligent life in it. As a result of this knowledge about the Universe, it is easy to see there are beings far more advanced than us and possessing capabilities we would consider miraculous though I suspect it is rather common technology to them. Given that knowledge, if these beings wish to reveal themselves to us, we should prepare for the encounter by being the best that we can be. We should prepare our whole being physically, emotionally, spiritually and mentally for such an experience. Now, I'm not saying that God will necessarily interfere with us while we are living, but if these beings were to appear to someone, I would like to think it would be to human-beings that have prepared themselves. I was struck by a similar topic last night. I've spent the last couple years working actively to learn to follow the Spirit, or more particularly, to learn to identify what comes to me from the Spirit. Because of those efforts, I have been led along a path that, in retrospect, has changed me dramatically, and convinced me that the Lord really is interested in me personally. But I never saw at the time the signs I can see now, and with one or two exceptions I was never sure beforehand it was the Lord telling me to take a specific course. In one case I definitely *was* sure, having received a powerful response to a specific question asked in prayer, which led me to make what was, at the time, a difficult sacrifice. That sacrifice put me in a position to receive much more subtle inspirations, and many of the ones I've followed have brought confirmatory blessings, but it sometimes has taken a while. No B.S. here!..... Once again Adrian you have given me light and truth that simply causes my soul to sing! I am in the midst of some life altering choices right now. I am so happy you posted this and it will help me to move forward in faith believing. Carry on Brother Larsen! What is the difference in communication from the Holy Ghost & discerning between something that is false and something that is true but, the adversary imposes a 'dark feeling' to impede the individual from persisting to further truth? I have glanced through your blog a number of times and I have not at all been a fan of the things you have written. However, I agree with this post 100%! Faith without works is dead... Seeking answers without faith and without works is pointless. This is my favorite post of yours so far Adrian. Even standing alone, without the previous post, it is great! I wish I had known this by the time I was 8 and throughout my life. I guess I've been a sign seeker for a while. Thank you , this post has been a game-changer for me. Thank you! This gives me a lot to contemplate. I've experienced the burning bosom throughout my life, and still don't fully understand it and the revelatory process. This post is very helpful as I continue to seek further light. Great post. I think I'm understanding this idea better now than before. But I have a sincere question. When you receive such an answer as you did in Rock Hill, do you then from that day forth testify "I know the Book of Mormon is true..." And then "I know that Joseph was a prophet" obviously by mere logic and of course "I know Jeus lives..." You get the idea. Am I a doubting Thomas so to speak if I say I believe the Book of Mormon is true, if I too have had the same experience you have with the book? Or is it more appopriate to say, you know the BOM is true but for now you believe in Christ, rather than saying you know He lives. What if someone has had the burning experience regarding the Saviour but has yet to see Him. Do they know? Or do they believe. Or is it better put that they believe with faith and are awaiting the pure knowledge that will come? Thanks for taking the time to share these powerful ideas. These are great questions. I believe knowledge isn't perfect in a thing until the evidence has been fully received. For example: Do I know the book is true? Yes. I have had an unmistakable witness from God. Therefore, do I know Joseph Smith received gold plates from an angel? No. I believe that, but I have not seen the plates or received other evidence or witness. Do I know Joseph was a prophet? I believe he was, and I accept and act on his words. I do not have sure knowledge yet. Therefore, I would have to say I believe for most things yet. Of course, in Mormon culture, we tend to always say "I know" when we really mean we believe. But strictly speaking, very much of what we say we "know" we merely believe. Alma 32 is a masterful discourse on the topic. By the way, there's nothing wrong with "merely" believing, rather than knowing. This is not a sign of weakness, but rather a sign of strength. Those who will believe and act without knowing for a certainty are blessed of the Lord, while those who are brought to know but fail to act are cursed of the Lord. Alma 32:16. Thanks for your thoughtful reply. What you have said resonates for me. That quote has always bothered me, as for me it is much than a feeling of comfort (although it is certainly comforting). For me it can be a very a physical sensation, similar to how you describe it. That's not to say that everyone feels it or will feel it, but it is a bonafide unmistakable sign that can follow faith, as your post indicates. When missionaries invite others to read the Book of Mormon and ask to them to pray about it, aren't they asking the investigator to seek a sign from the Holy Spirit that it is true? Isn't that the very definition of obtaining a testimony, to receive a witness or sign from the spirit? There's a big difference between seeking signs IN faith and seeking signs FOR faith. Seeking signs FOR faith is what the scriptures speak against. In fact if you seek for signs FoR faith you are an adulterer. So why does an adulterer seek a sign? 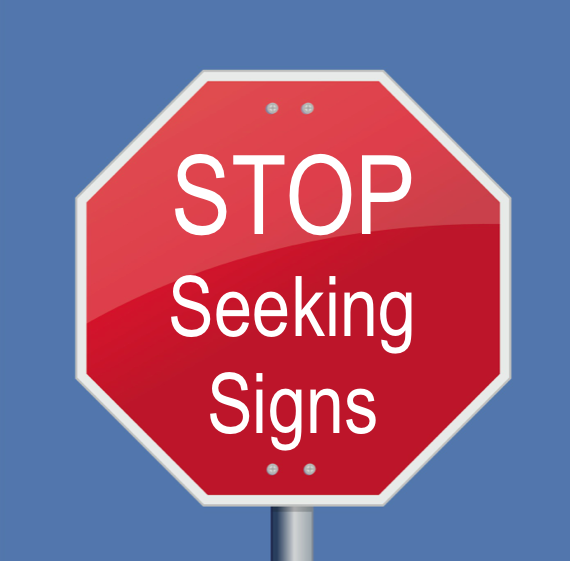 They seek a sign because their sensitivity to the spirit is so deficient that they want someone to prove something to them through the physical senses. Ok, now that that is all cleared up, we can talk about seeking signs IN faith. If I am already in possession of faith (I believe in God and am seeking to do his will), seeking signs, confirmations and spiritual experiences from God is a good thing. God wants us to seek them. How else could we obtain a testimony that something was true? When Nephi heard of his father's great vision of the tree of life he wanted to experience the same things. Did he seek these things for faith? No. He was already in possession of faith and wanted to experience the great blessing of the signs that follow faith. One time when I was working for a company and hadn't been paid for a couple months. My wife and I had prayed about going to this company and both felt that it was what God wanted, but you can only work so long without being paid. I went to God and said I would leave this company unless I was paid that week. I asked God to show me a sign. If he wanted me to stay I needed to be paid that week. I ended up receiving a check that week. Was I asking for a sign for faith? No. I already had faith in God. I was asking for a confirmation of my faith, a sign that would follow my faith. Adam, I think you make an excellent point about signs confirming faith that already exists. In the case of an investigator reading the Book of Mormon, I think there's a difference between a witness of the Spirit and a physical manifestation like a burning bosom. Yes, we certainly ask investigators to pray for confirmation, and they receive it. But as you stated, this is often in confirmation of what they are already willing to believe, rather than something that will convince them against their will. And it may be very small. Acting upon a small evidence, like the whisperings of the Spirit, may eventually lead to undeniable physical signs. Technically speaking, I suppose we could define both spiritual things and physical things as "signs" but the scriptures tend to speak of them as physical manifestations. Great story about your paycheck. I've done the same thing in different circumstances, asking the Lord to confirm what I already believe and am acting upon. He does. I really like your posts, they are always well thought out. I would like to know your opinion, as this has concerned me for a while. As I am reading this post, I am concerned that it creates a catch-22 for people trying to believe. The baseline assumption that the orthodox LDS make, and make imperative, is that you have to believe the gospel of Jesus Christ is true, first. Beyond that, you have to assume that the belief-system in the Book of Mormon is what God wants you to follow in order to exercise faith. In formulating your post here, you made the same assumption: The Mormon belief-system, out of all of the belief-systems ever articulated in human history, is the one you will need to follow and have faith in in order for God to confirm to you it is true. The truth is, that is a pretty serious assumption, especially when so many people confess having the Spirit of God, in their own way, confirm their own belief-system. People testify that they feel and know, with every fiber of their being, that Allah is God, and that the Prophet is above Christ, and that Christians are shirking. What is the difference between your experience, and theirs? It seems to be simply the belief-system you followed and had faith in previous to praying. If that is true, following the logic you set forth here, people should be required to study every religion and belief-system, follow it, and pray if its not true. Otherwise, how can one be sure that they are following God's truth? This is the catch. If we only get the testimony after following, how do we know which belief to follow to be eligible for the testimony? Do we have to guess? Test them all? Or do we have to pray for ...a sign? Thank you for this question. It’s a very good one. Really, it gets to the heart of the matter. What is truth? What is the truth about God, this life, our purpose, and salvation? Where do I start? All religions have something to say about the above questions. Of course, you cannot learn anything about any of these things until someone with sure knowledge teaches what they know. Someone must first experience God, and then teach others. Then it becomes incumbent upon the hearer to test the truths shared. This is the pattern shown us in scripture and in the temple. Adam sought true messengers from Father. God sends preachers with knowledge. He heard the message. It persuaded him. He wanted to believe it. He showed his faith by crying mightily unto the God he was trying to know. And his faith was confirmed. There are many truths in all religions, as they all spring from the same original source. And there are many corruptions as well. Our challenge is to seek the true, reject the false, and learn that original religion that brought the ancients into God’s presence. The earnest and relentless seeker will arrive at truth, no matter where the path begins. But the earnest and relentless seeker is a very rare commodity. Almost all of us gain a little truth and stop there, closing our minds to anything further, and attempting to force others to believe as we do. And hence, we have so many religions, most of which insist upon conformity. No, you’re not required to study every religion in the world, nor are you required to start from the LDS Mormon viewpoint. You can start with something very basic like, God, are you up there? How can I know you?